The only way to get tall nuts is to make your own. I have made a few in the past but my current project is going to need about 36 tall #2 -56 nuts. I have used 303 stainless hex and parted them off after tapping but I seen to loose more than I make and there is still a bur to remove and chamfer to add. On top of that, since you can only tap about 5/8" deep with a #2-56 tap, you only get 3 useable nuts, allowing for parting tool loss for each setup. A slow and laborious process at best. Today, I decided to get serious and get some production going. 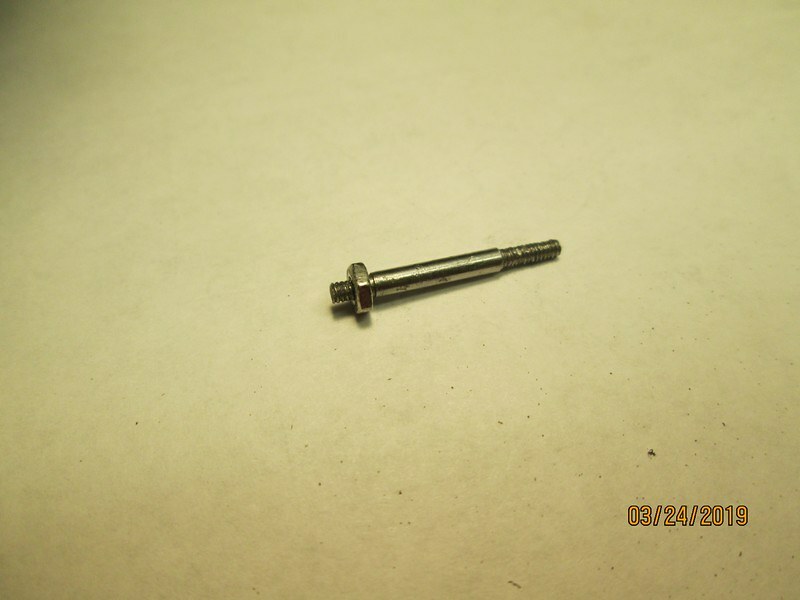 The first step was to keeo from loosing them so used a short stud a a #2-56 large pattern nut. 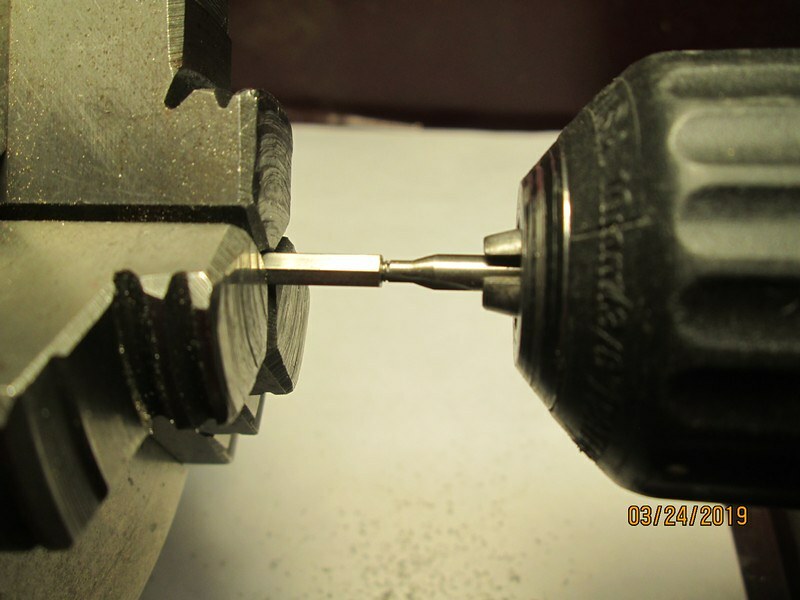 After cranking the nut down against the shoulder, I ground off the threaded shank to leave 3 full threads. 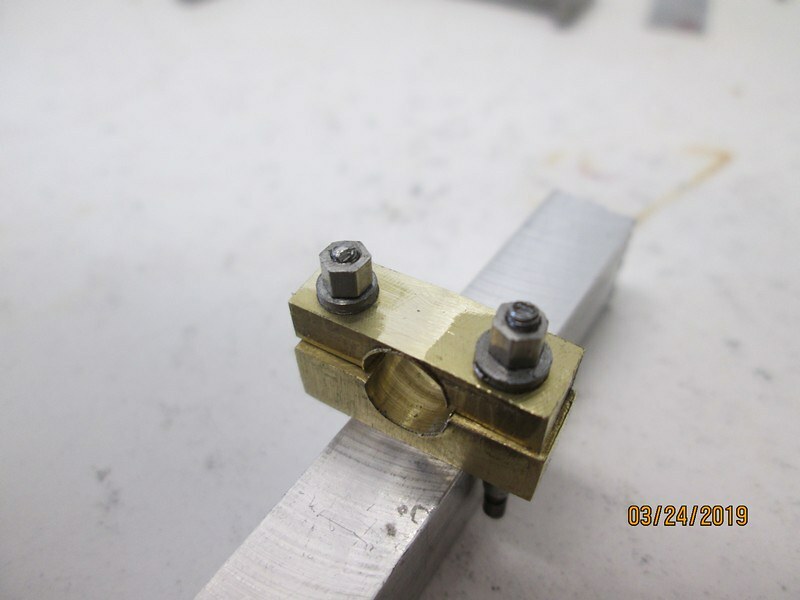 This will be used as a mandrel for polishing and chamfering the nut after cutting off. The hex stock is drilled and tapped in the lathe as you would expect. 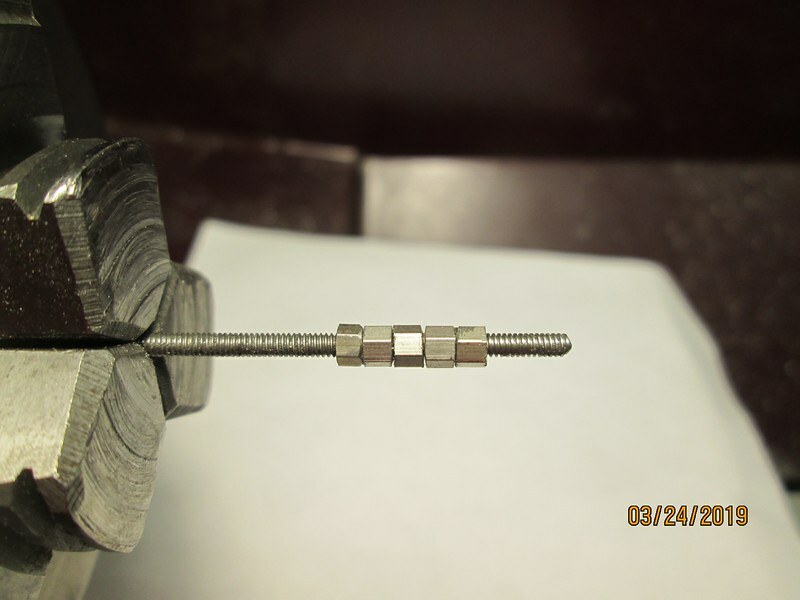 The three exposed threads are then screwed into the stock, tight up against the large pattern nut. The mandrel is only an inch long. 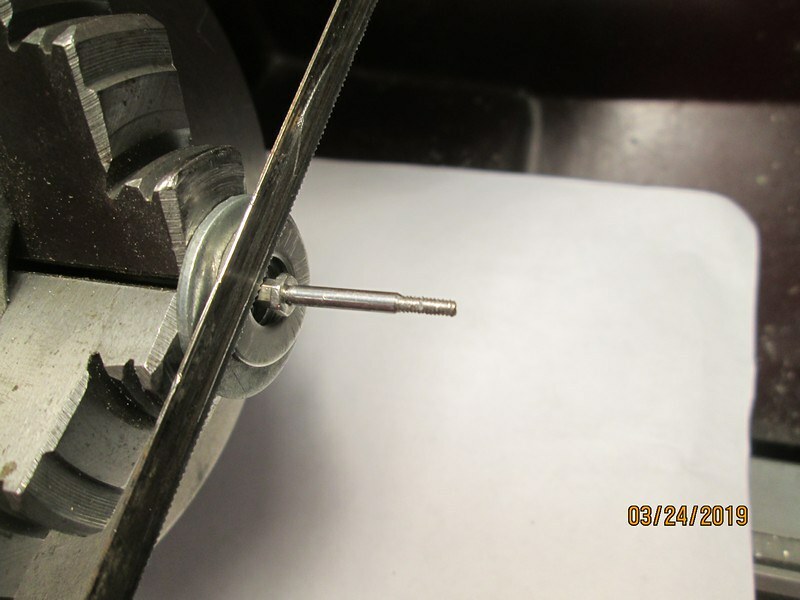 I then use a special gauge ( small needle nose pliers) to set the exposed length of stock to the desired height of the nut plus the thickness of two steel washers. 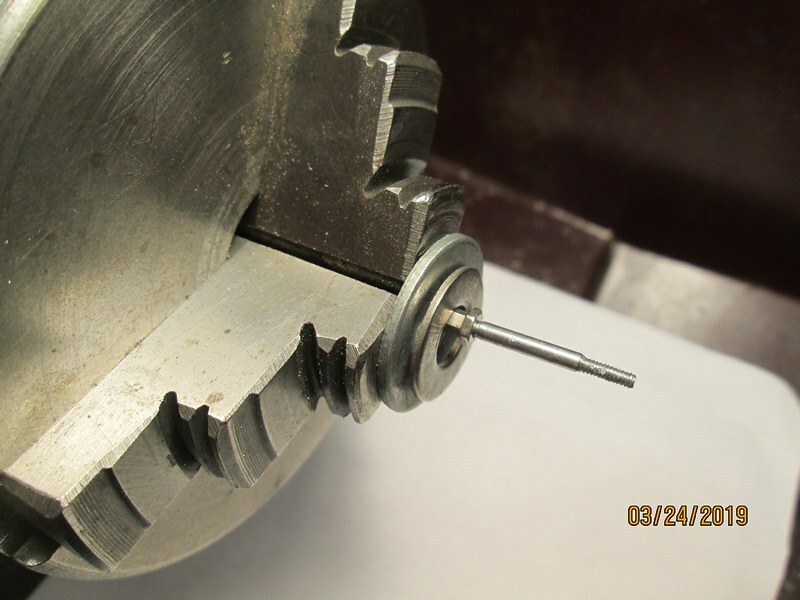 The washers are slipped over the end of the mandrel and the large nut to act as a guide and to protect the jaws of the lathe chuck. 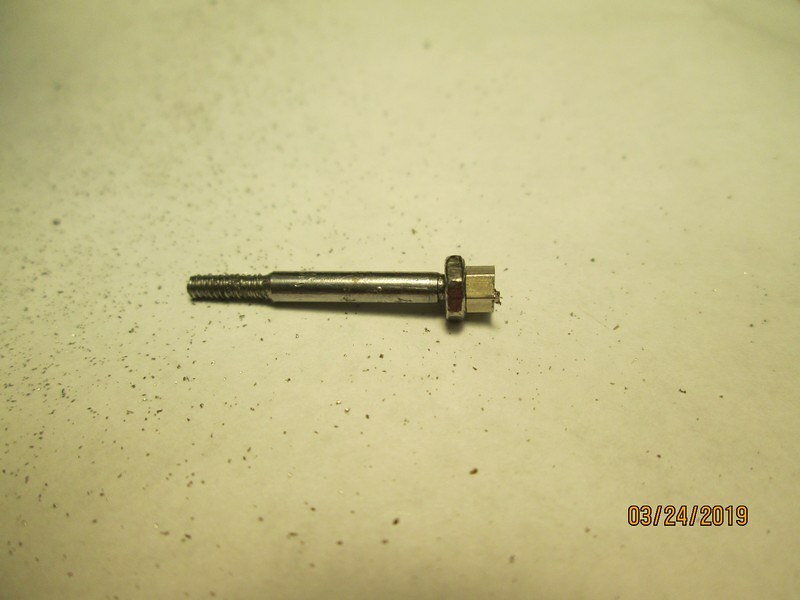 Using a small hacksaw against the second washer, I cut the nut off. 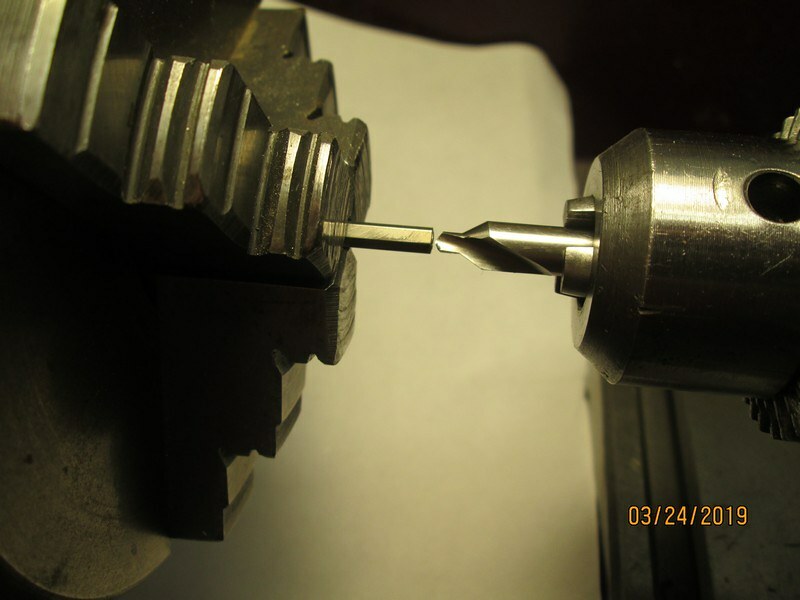 I drops into a small tray under the chuck, and because it is attached to the mandrel, it doesn't bounce around and get lost. 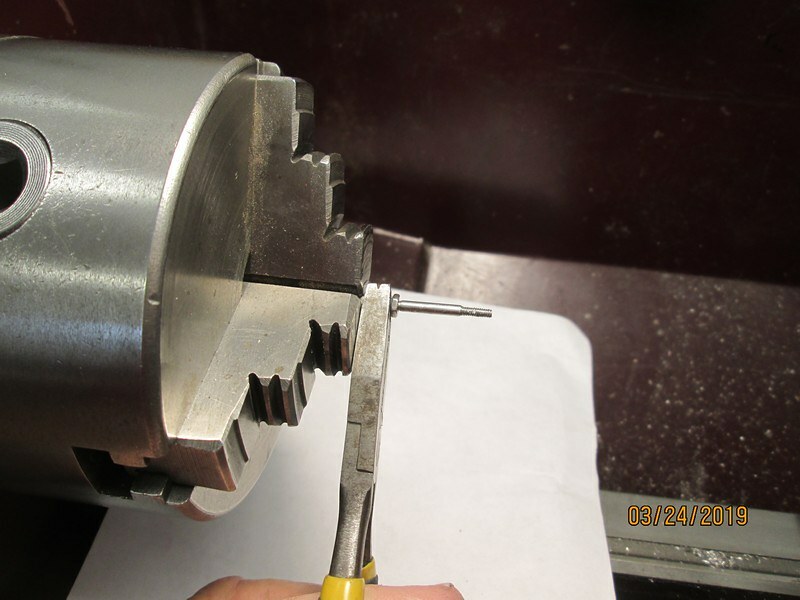 I pick up a file and file the end of the stock in the chuck to remove any burr and the pickup the mandrel with nut still attached from the tray. 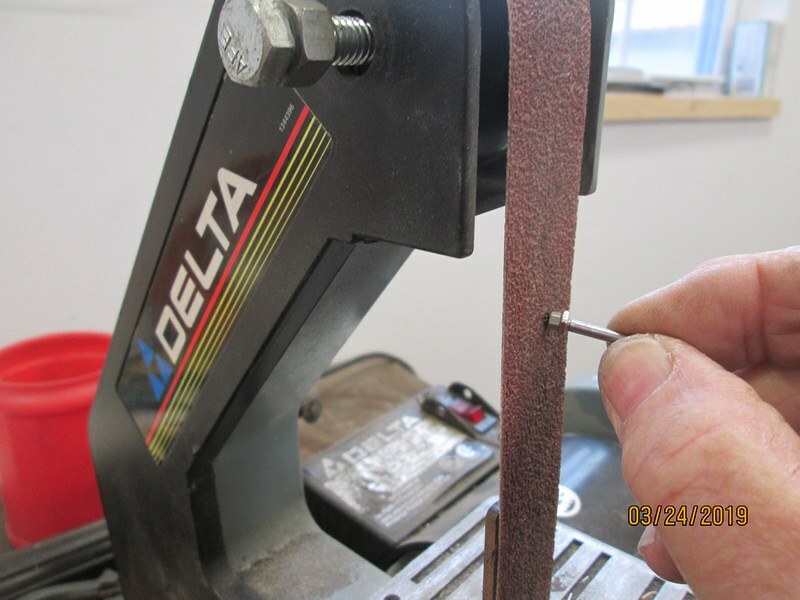 A five second twiddle against the belt sander to remove any burr and add a little chamfer. Take a breath and repeat. I can get four nuts before needing to drill and tap again. 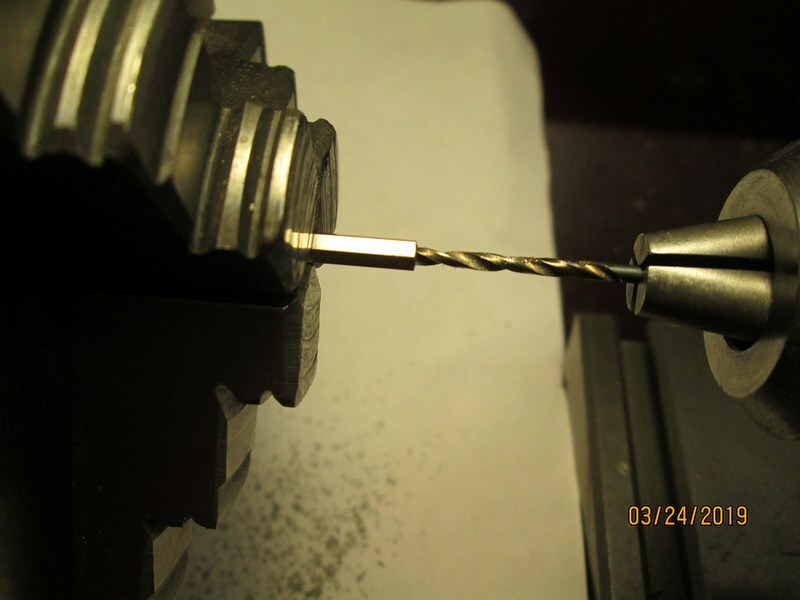 My tap drill wanders off center very slightly but I can get three sets before the hole has wandered off center enough that I need to clean up the end of the stock with a parting and respot with a center drill. After I got the process worked out, I was able to 40 nuts in less than an hour before running out of stock. From now on, I will hacksaw my nuts off. Are there supposed to be pictures? Of course there are pictures. Wanna see um? 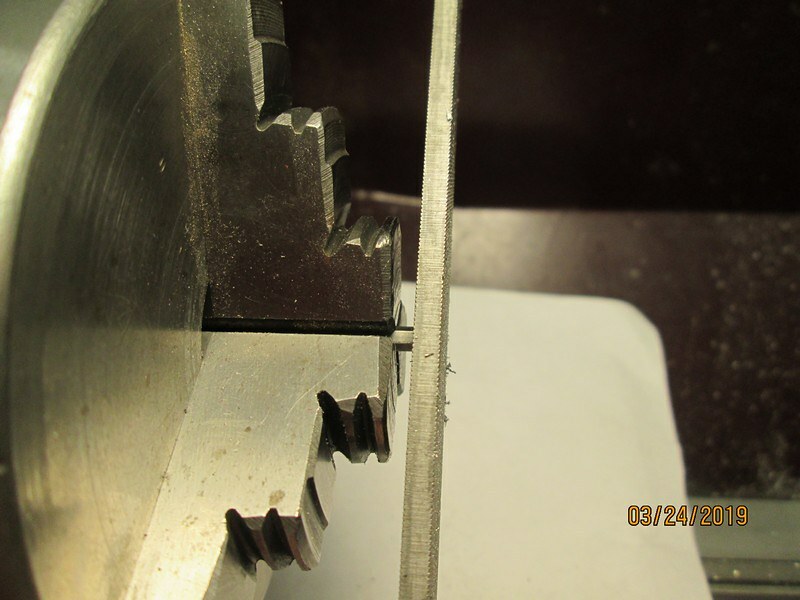 And if you grind your parting tool correctly it will put the chamfer on the stock still in the chuck as well as parting off the completed nut so no need to file or do a second op to chamfer. I suppose I could do a better job of grinding the parting tool. I may try that again. But there is still the problem of flying nuts as the last bit is parted. 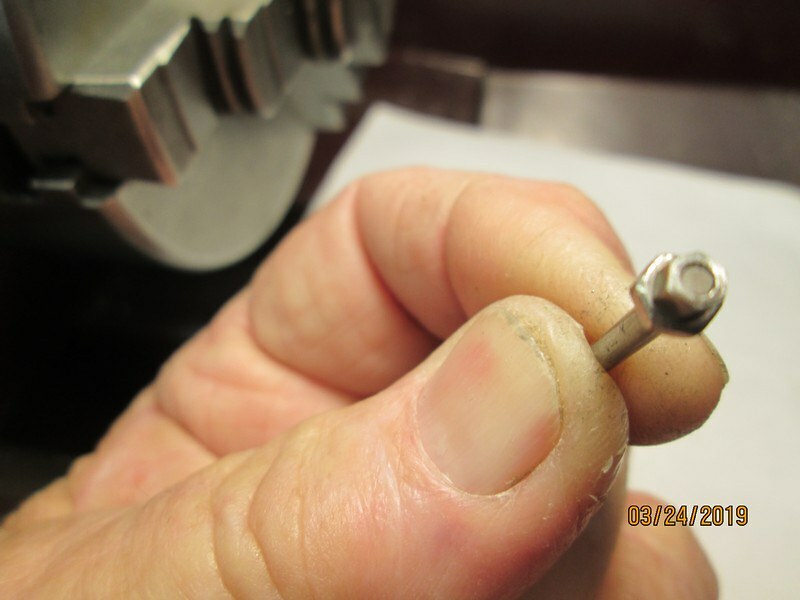 I also felt the need to run the tap through the parted off nut to be sure of good thread form without burrs. But I think I will stick with the hacksaw for now. I get a very high rate of output compared to previous parting efforts. Technical problems resolved. Here are pics. #1 Spot with center drill. 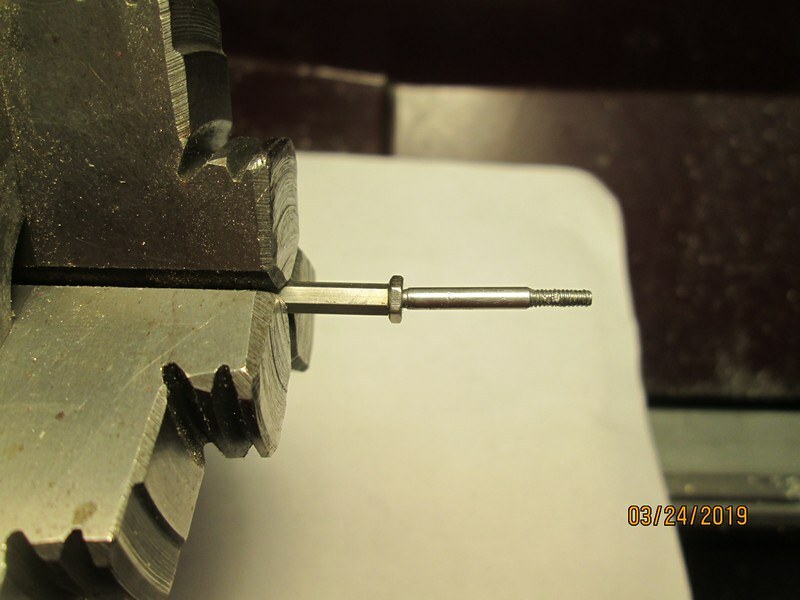 #2 Drill for tapping, 3/5" deep. #8 Mandrel with rough nut. This is a bunch of finished nuts and a couple of nuts applied. They are not perfect but that is not out of character with the rest of the model. I know. I need to work on washers now. That's almost as good as drunken shop elves.